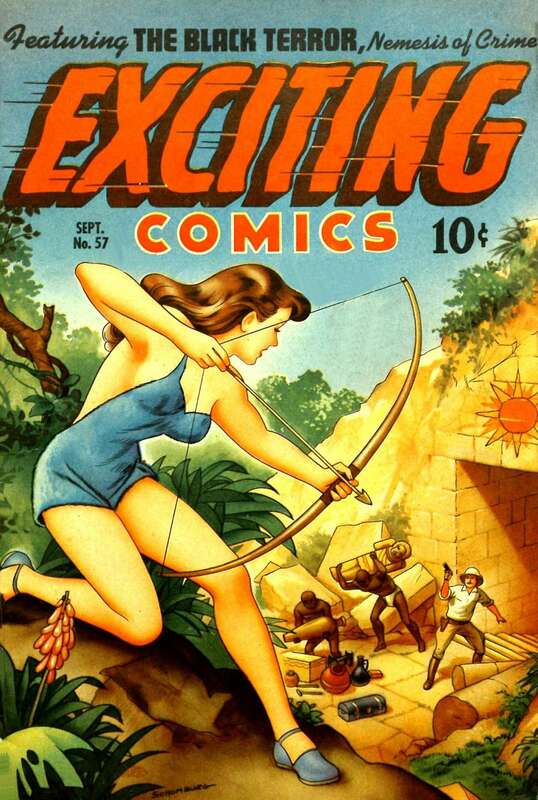 Published under Better, one of the Ned Pines publishing imprints, Exciting Comics had a stellar run between 1940 and 1949. The comic primarily featured the superhero The Black Terror, who appeared through virtually the entire run and on covers through Issue #52 (more on him later!). But we simply couldn't resist showcasing the beautiful painted cover of artist Alex Schomburg, highlighting one of the series' notable backup characters, Judy of the Jungle. Introduced just two issues earlier, Judy's introductory story arc from Issue #55 draws to a thrilling conclusion as Judy confronts her father's killer in "Jungle Vendetta." Also in Exciting Comics #57: a zany Roger Dodger goes on an autograph hunt, the most dysfunctional family you'll ever see searches for a killer in "The Crime Crushers," ace fighter pilot Strut Simmons returns to the cockpit, and much more! A short-lived title from Ace Magazines, "Our Flag" showcased the patriotic prowess of Jim Courntey, aka "The Flag," and his adoptive disabled war veteran father, John. The chaotic cover art, while imaginative, actually has little to do with the main Flag story ... as rumors of The Flag's death abound, and Nazi infiltrators rise up to sabotage America's war effort, who will thwart the kidnapping of the wealthy leader of a patriotic group? This beautifully drawn story by Illustrator's Hall of Fame artist Harry Anderson is one you won't want to miss! Also in Our Flag #5: "The Unknown Soldier" helps the allies thwart a new Nazi weapon, the first appearance of "Mr. Risk," the man without fear, and plenty more where that came from! Check out all five issues of "Our Flag" on VillainPaper right now!